While today is Saint Patrick's Day, that's not why I've come to write. I know that I've been neglectful of all my sites lately but sometimes, in life, you need to handle life and writing takes a back seat. Today, I came to write about one of the wonderful pieces that have caused me to be away. 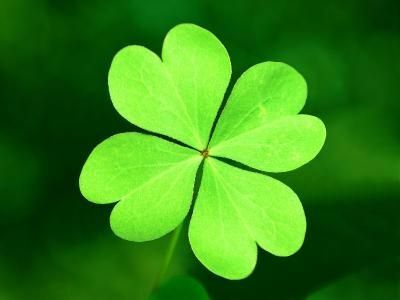 Do you see that shamrock over there? Do you know what I love best about it? I love that it's made up of four hearts. It has four hearts with one stem. So does one of the most wonderful pieces of my life right now. You see, I've found family. Oh I know that I've had a birth family and that there are certainly friends in my life who have made up a family of another sort, but this family is different. This family is made up of three amazing people who didn't have to accept me. In fact, on some levels, it would have been so much easier to completely shut me out. They didn't though and that's just proof of how wonderful they really are. Over the past few weeks, we've gone through our tough times and I'm sure that all of us have wondered if the bruises were worth it. They've shown me though just how strong love can be and how strong they are. They have inspired me to be a better person than I am and to open up myself to each of them. So today, while some are drinking Guinness and eating corned beef, I'm just here being thankful. Saint Patrick might have brought Christianity to Ireland, but these three people have brought me so much more. They've shown me love, strength and the sheer joy that can come when someone wraps their arms around you. They've shown me what it means to really and truly believe in someone. They've let me in and not only that, but they've wrapped their arms tight around me and asked me to stay. I cannot begin to express what any of this means to me. We're not together right now and I don't know when we will be but I do know that none of us will ever really be alone again. We all carry a piece of the others, no matter where we are or where we go. I love them..each and every one of them and I carry the knowledge that they love me. So while we are four hearts, we are part of one whole..one family and it's something that I am thankful beyond measure for.